The Fifa officials have weighed in and decided to suspend Suarez for 9 matches. As was expected, the Fifa officials acted swiftly and aggressively, and by doing so revealed that they all must have big dicks. No news outlets have been able to contact Suarez since his punishment. There have been murmurs in Milan, Italy of Suarez being spotted sitting alone at a restaurant drinking a bottle of aged Merlot and attempting to order the “Carpaccio de Human Flesh” as his entrée. When the waiter informed Suarez they did not have this dish, he reeled back and dug his 4-inch incisors into his shoulder blade. 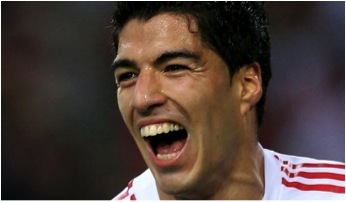 Restaurant employees and patrons were able to eventually ward off Suarez after pelting him with cloves of garlic. 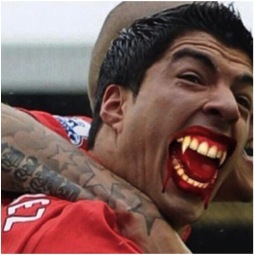 It is currently suspected that Suarez is completely morphing into a vampire, so for everyone in Milan pack those pockets with garlic, stay off the streets at night, and if you see Suarez put a few bullets in him (make sure to study up on your kill spots). Our crew did a little research and compared pictures of Suarez earlier in his career to current ones to see if his evolution into a vampire was noticeable. Above is a young Suarez with a seemingly normal pair of chompers, but if you look closely there certainly are some red flags. The teeth are all a little oversized, and his bicuspids are clearly rubbing shoulders a little too much with those canines, leaving way too much room for the incisors to develop. If dentists had noticed this earlier this rampage could have been avoidable. A current look at Suarez. Looks like the offspring of an Egyptian Fruit Bat and a Kardashian. I’d say he’s gone full vampire. Our hearts here at Wise News go out to the people of Milan, as well as the Uruguay team, who clearly bit off more than they can chew by having Suarez be on the team.